Vasodilators are medications used to open up blood vessels and prevent heart-related health conditions, but there are also natural vasodilators that can dilate vessels and increase blood flow. Vasodilators impact the muscle walls of the arteries and veins. They prevent the muscles from tightening and the wall from narrowing, which then allow blood to flow more freely through vessels. When blood is flowing easily, the heart doesn’t have to work as hard and blood pressure is reduced. The production of NO—nitric oxide—is important for the regulation of blood flow. Abnormal NO production occurs in different disease situations. It can have a negative impact on blood flow and vascular functions. Nitric oxide is produced from the amino acid L-arginine by action from nitric oxide synthase (NOS). Vascular actions of NO can include preventing sympathetic vasoconstriction, acting as an anti-inflammatory, having an anti-thrombotic effect, and preventing muscle hyperplasia. On the other hand, when NO production is hampered, it can lead to hypertension, thrombosis, vascular hypertrophy and stenosis, or excess inflammation. Nitric oxide is a strong vasodilator; something you can get from flavonoid and L-arginine rich foods. There are many natural vasodilator foods to choose from. Read on for a comprehensive list of some of the best natural vasodilator food options. Nitric oxide can reduce blood pressure as well as prevent artery blockage and stroke. Boosting nitric oxide levels with food is sometimes a preferred option. No matter what your taste buds are like, you are bound to find something on the following list of natural vasodilators that you can enjoy. Raw cacao bean increases nitric oxide and is also full of antioxidants. It can lower blood pressure and impact markers of inflammation. Keep in mind that it is loaded with sugar, so it should be consumed occasionally. Remember that we are referring to dark chocolate only. Research suggests that vitamin C protects nitric oxide molecules from free radical damage, making it a good natural vasodilator. Foods like oranges, lemons, and grapefruit contain large amounts of vitamin C. This vitamin is known to raise levels of nitric oxide synthase, which again is the enzyme that converts L-arginine into nitric oxide. This fruit is capable of boosting nitric oxide, reducing inflammation, and reducing oxidative stress, which are all factors related to coronary artery disease. Polyphenols in pomegranate help convert nitrite into nitric oxide, making it a viable natural vasodilator. This nut is high in L-arginine, so it can keep blood vessels open. Many other nuts are also good sources of L-arginine. Nutritionists suggest soaking nuts for five to six hours before consuming them. If you don’t like walnuts, you can consider almonds, cashews, pine nuts, Brazil nuts, or macadamia nuts. This type of lettuce has the highest source of nitrates. It can be a little bitter, so many people mix it in with other types of lettuce or sauté it with other vegetables. Arugula is also called garden rocket or salad rocket. It is often referred to in England as a “fancy pants” (more sophisticated) kind of leaf lettuce. In its fresh form (not canned), this leafy vegetable is packed with nitrates. This versatile veggie can be added to soups, stews, pasta dishes, or even pizza. A number of studies call beetroot an excellent vasodilator, especially when it comes to lowering blood pressure. Beets are also a source of anti-oxidants and betalains, which are good anti-inflammatories. While this does not contain a lot of nitrates, it does boost the enzyme nitric oxide synthase. Research indicates that garlic supplements can lower blood pressure and have many other health benefits. Garlic is a very popular vegetable among many different cultures and can be used in countless dishes. This popular herb, which is also found in many different supplements, is a natural vasodilator. The great thing about parsley is that it also contains other properties that promote good health. Since parsley does not have a strong flavor, it is used often in restaurants. The ginger root is known as a vasodilator. 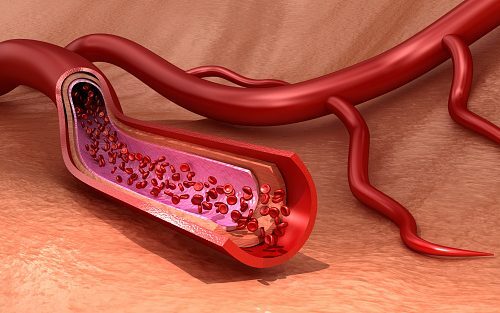 It can open up blood vessels to allow blood to pass through. It also has anti-inflammatory properties. The root of the ginger can be consumed fresh, powdered, dry as a spice, in oil form, or as a juice. There are many other health benefits linked to ginger root besides the fact that it can act like a vasodilator. This spice has a warming impact, which can help dilate blood vessels. Using excessive amounts of cayenne is not recommended, but including a little in meals can be helpful. Fresh rosemary can increase blood flow and is a great food additive. Poultry and lamb are good examples of foods that many people sprinkle with rosemary. This amino acid can be found in protein-rich foods, such as chicken, turkey, and dairy products. Arginine is a precursor to nitric oxide, so it is one of the best natural vasodilator options. This has been used for centuries to address blood circulation problems and heart issues. It can interact with other heart medications, so it is important to use Hawthorne under the supervision of a qualified healthcare professional. Research has shown that coffee can boost vasodilation and blood flow. One study conducted in 2015 showed that men are less likely to experience erectile dysfunction due to poor blood flow when they drink two or more cups of coffee each day. When it comes to the best natural vasodilator options, it is nice to see that there are a wide variety of foods to choose from. While this should bring some reassurance, especially to those who are not keen on vasodilator medications, any use of foods to control vascular health should be discussed with a doctor. Taking treatment into your own hands can be dangerous. When planned in consultation with a healthcare professional though, foods can make a big difference when it comes to vasodilation.